"En av de mange" (One of the many) - sculpture made by Ausa Hofman-Bang (1882-1920). 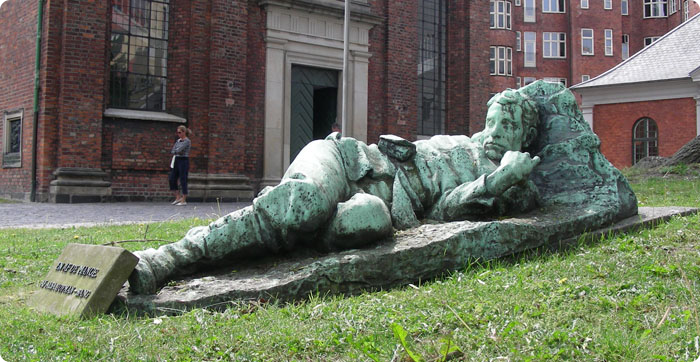 Made in 1915 and donated by the Hofman-Bang family in 1934, the sculpture is made of bronze and is located outside the Garnision church in Copenhagen. It depicts a fallen soldier in the First World War. A full-size copy of this sculpture can be seen in the small museum at Hofmansgave. Picture courtesy of Ib Rasmussen (ib@ibras.dk).